An increasing number of people are becoming interested in and are using weights to strengthen their bodies, build muscle and get the definition they desire. Whether you are a basic lifter, a power lifter or into crossfit, this guide will help you determine the best Olympic set which has the features to suit your training needs. 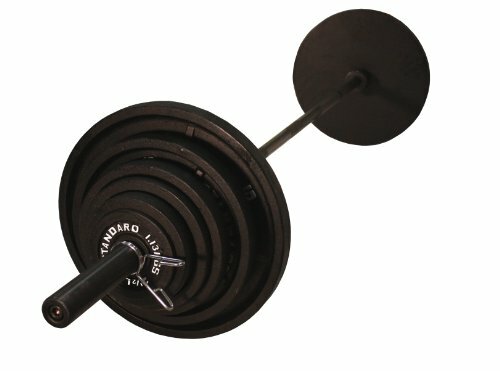 Olympic Weight Set Types To Consider Buying ? The most common Olympic weight plate set is the 300 pound for home use. The varieties of sets available differ slightly in terms of the design features of the plates, the grips on the plates and bars, as well as the intended use. 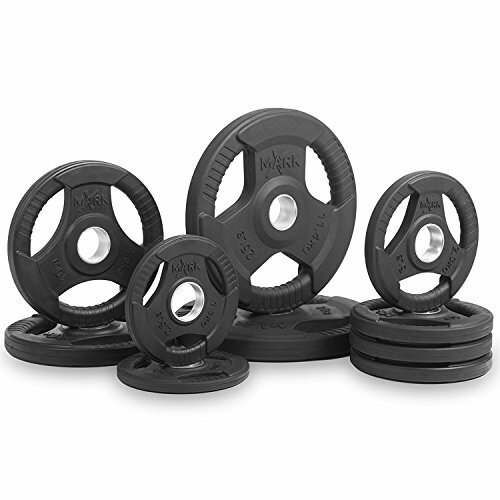 The weight plates are commonly sold in sets along with a barbell, however they can be purchased individually or in pairs and used as replacement plates for damaged, worn or warped plates from a previous set. Some weight plates have special design features which allow them to be securely gripped for placement onto the barbell or to be used without a metal bar. The barbells are designed to be used with safety collars to secure the weight plates in place and also have cross hatched diagonal lines on the handles for firm and secure gripping during lifting. Some weights are used for regular weight lifting, bench pressing, dead lifting or in crossfit. The best sets for use in crossfit are the ones which have low bounce and / or rubberized weight plates. The Premium Color Bumper Plate Solid Rubber with Steel Insert is perfect for crossfit users, gym owners and anyone who wants a premium colored bumper plates to workout with. They are designed to have low bounce and great durability, because they were manufactured to be dropped from heights which make these one of the best olympic weight sets for crossfit. They fit any standard Olympic metal bar. Each of the plates are color coded as to the weight it represents which range from 10 to 45 pound plates. The plate construction itself is made out of 100 percent tough rubber with steel inserts. This is not a complete 300 lb olympic set. I added this to the list so that I cover any one who is looking to buy single weighted plates to stock a commercial gym or who is trying to build a high end home gym. As for complete sets you can buy these in the range of 160 to 1000 lb sets. You will need to purchase collars and a weighted olympic bar to complete the full set. So, the best user for this is anyone serious about cross fit workouts, power lifting or you just want a really high end set because you can afford it and you want the best. 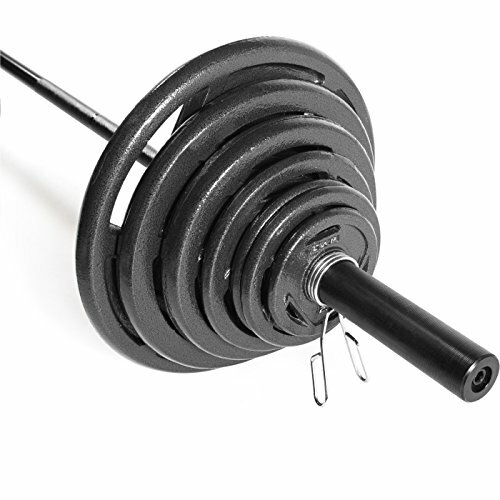 The CAP Barbell 300-Pound Set (Includes 7 Ft Bar) is perfect for weight training, has plates which go up to 300 pounds and are designed with rubber grips. You will get a 7 foot olympic bar, 2 spring clamps and weights. So you have a couple options when buying a cap barbell set. Once is in a black or grey set which is the cheaper set and then you have a rubber coated olympic set option which is the more expensive option and is about twice the normal price. Note: The black set comes with an open grip hole or handle for the weight. The grey set does not and it has the big lip to carry the weight. Special Note on this as well because it does include a 7 foot olympic bar which makes this perfect starter set. The USA Sports 300 lb. Olympic Weight Set (Black Bar) comes with a 7 foot bar, 600 pounds of weight plates and spring collars. The USA Sports 300 lb. 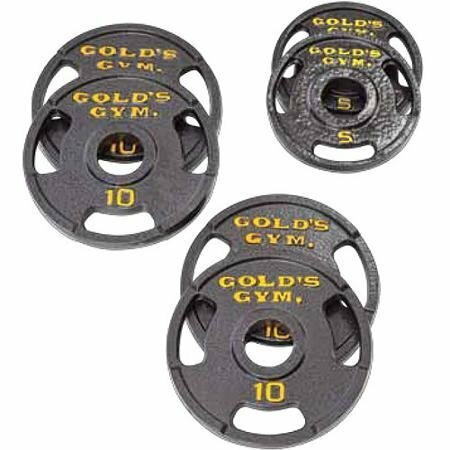 Olympic Weight Set (chrome bar), comes with up to 300 pounds of Olympic weight plates, has three sections for gripping on each, a nice bar made of chrome and Olympic spring collars. The plates are cast iron with grey enamel finish on it with the letters raised with sliver numbers. There are multiple versions USA Sports make that vary in the amount of weight you get and the capacity of the bar. In this model the weights are grey color with a stand lip to carry them. 2 x 45lb, 2 x 35lbs , 2 x 25lbs, 2 x 10lbs, 2 x 5lbs 2 x 2.5lbs. So, this is your basic set that works great for anyone starting out with wanting a complete set to go with their adjustable bench at home. The Combo offer XMark Fitness 7 ft. Olympic Exercise Bar With Premium Quality Rubber Coated Tri-grip Olympic Plate Weight Package, comes with a 38 pound 7 foot metal bar with high quality Black Manganese phosphate coating to resist rust and abrasion. It has a plate capacity of up to 700 pounds, with each plate having three grip areas. These are nice rubber coated plates with a 3 handle openings that make it really easy to grab. The total amount of weight you are buying with this set is 255lbs which is less than the other ones in my olympic weight set review. You can select a different model on amazon to get more or less weight with it so don't worry. As with all rubber coated weights you should expect to pay more for it. The bar has a solid steel hub made to precision so the plates slide on and off perfectly. X-mark is a higher quality fitness maker so you should expect more out of it and they do back it up with a great product. Just to recap this is a higher end olympic rubber set so it will cost more. Xmark makes an extremely high quality product and you have 3 easy grip handle areas on the weight so they are worth the expense if you are after quality. 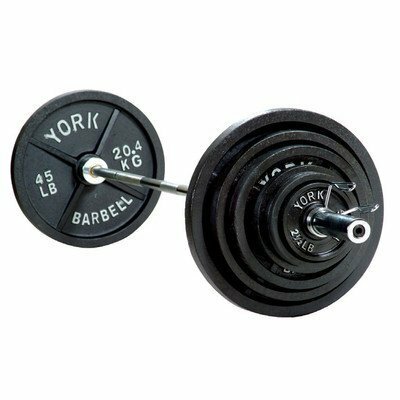 The York 300 lb 2" International Olympic Set, comes with 300 pounds of weight plates and Olympic spring steel collars for securing them to the metal bar. The olympic barbell has a 700 lb weight capacity. This is a basic set that is painted black and is made out of cast iron. It's a bit expensive compared to the others but I wanted to throw this in there because York has been around for years producing these weights. It does have the nice white writing on the black paints and the standard lip that most of you are used to grabbing when hauling them around. It is exactly what you would expect out of a 300 pound cast iron olympic weights. The Gold's Gym 110-lb. Olympic Barbell Weight Set is ideal for bench pressing to develop upper body strength. It comes with a 7 foot bar, and Olympic spring clamps. It is the best set for dead lifts and bench presses if you are looking to just tone your upper body. This is definitely a cheap set based on price and it's mainly due to the fact that it only comes with a small amount of weight. You get 2 x 5 lb, 2 x 10 lb, 2 x 25 lb and the olympic bar. I wanted to include this because it is a great starter set. It will get you going if you currently don't need a lot of weight to start with but you want to buy more down the road to expand the set. The plates are made out of cast-iron and very durable just like you would expect. The bar comes in 3 pieces so you will have to put that together and it would not be something you would expect to do a huge amount of weight with. The Body Solid Rubber Grip Olympic Weight Set has 3 different options to choose from depending on how much weight you are looking to use. You have a 300, 400 and 500 pound weight options. It does come with a standard 7 ft olympic bar that weighs 45 lbs as you would expect. It comes with rubber coated olympic weighted plates which is great for not scratching the floor or walls. The holes are the standard 2" holes so you can use these on other bars or use other weights for the olympic bar if you have them. To secure the weights they come with spring collars to keep the weight on. What's a little unique on these is that there are 4 opens to grab the the plate with and there are indentions on the plate that your fingers will fit into to make sure you get a solid grip. The writing on the plate is black if that does matter to some. The 300 pound set comes with the standard weight increments. the 400 pound set adds two extra 45 pound plates and an extra two 5 pound plates. This is a very nice heavy duty rubber plated set that you do not have to worry about flaking or rusting. Note: These are price and top of the line. More for you serious folks. These are weights which have been crafted according to the rigorous standards of the International Olympic Association (IOC). They are designed to match up to the same sizes, dimensions and weights as the ones used to compete internationally. 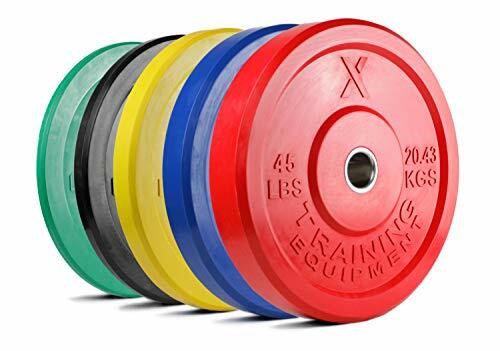 The one key difference between Olympic regulation weight plates and the ones designed for use at home is that they do not all have the protective rubber coating. If this was added to your home gym olympic set, it would push the cost up so high, that it would become impractical to purchase. Instead, the plates are coated with alternative surface protectants, like rubber and vinyl, which prevents them from rusting or becoming easily damaged. The plate sets are made of iron and range in weight from 2 ½ pounds up to 45 pounds each. I would highly recommend using them if you do a lot of bench press workouts, hang cleans and dead lifts. Olympic weights were designed out of the box to be sturdy and tough. They have one purpose in mind and that is to allow you to lift weights while adding a lot of weight with ease. Almost all of them come with a standard 2" hole that fits the standard 6 and 7 foot olympic bars. They all simply slide on to the bar and are secured by some type of collar. Most of them will be made out of cast iron and there are some that are rubber. The set is designed for people who want to do exercises like bench press, dead lifts, curls, clean and jerks, military press and several other exercises. This makes it a very durable piece of equipment and value for money. The material composition of the bar as well as the presence of knurling on the bar whether in two positions on either side or in the center, will determine the type of bar you choose. The type of collar the weights set comes with also makes a difference in the way some people choose their sets. The collars comes in a variety of forms, some which include the common spring collar, muscle clamps, lockjaw collars and strap barbell collars, to name a few. Note: The regular steel clamps with no handle cover are the cheapest collars and they tend to loose the tightness over time to hold the weights in place. Try to get the sprig collar with rubber clamps or step up to the high end and grab a pair of locking clamps. You can get these in various colors as well to top it off. To obtain a durable set of weighted olympic plates, the type of protective coating is important for the durability and protects it from chipping, rust and other damage from the elements. Most Olympic weight plates are made of cast iron metal. Some sets have metal bars which are made of steel. So, as time goes on you might see some wear on them. For anyone who is going to workout side with them I would highly recommend using the rubber bumper plates so you don't worry about any rust issues. The rubber plates are also recommend for those who are dropping the weights like in power lifting exercises or crossfit exercises. This could be a deal breaker for some. I have been using olympic weights for years and I do have a strong opinion about this buying factor. For handling the smaller 5-10 pound plates handling them is really irrelevant. When you start handling the 25-45 pound plates you really want a solid grip and you want it to be easy to handle. You will see standard Cast iron plates that basically have a small lip on the outer edge you grab the plate with. So you are grabbing the 45 lb plate and holding it with your finger tips to put it on the bar. It's not a big deal if you are strong enough to do it. For me personally I would prefer the weighted plate that actually has a cut out to grab the plate with your full hand. It's more like a handle per say and it is much easier and safer to carry the weight to put on the olympic bar. The standard Olympic weight bar length is 7 feet and weights 45 pounds. Other weight bars come as 6 foot long bars. There are different weight capacities that are offered by different olympic weight bar makers. That standard is 300 pound weight capacity. This will suffice for most people. For those of you that are going to get into that 400-800 pound mark when exercising you will obviously want a bar that is geared toward that amount of weight specifically. There are two bars that I would recommend looking at that have a high weight capacity. One is the cap barbell olympic 7' bar and the other one is the Rep Gladiator Olympic bar that has a 1500 pound capacity. These will fit perfectly on your weight bench at home too. The best Olympic weight set for use in crossfit needs to have plates which produce low bounce and may also be rubberized to prevent damage to you or the floor when dropped. Power lifters or basic at home lifters do not necessarily need that feature and have a wider range of options to choose from to find the best Olympic style set for their weight training goals. The Contrast Bumper Plate Sets / Virgin Rubber with Steel Insert and Color Contrast Lettering / CrossFit, Strength Training and Weightlifting Equipment, is the perfect all around if you do not want to restrict yourself to a specialized type of weights. It has a stainless steel, bar low bounce thinner plates and goes up to 370 pounds. The Troy Barbell VTX Rubber Coated 300 Pound Olympic Weight Set with Bar & collars comes with 255 pounds of weights, a 45 pound bar, and rubber coated plates which have grip holes. Whatever your weight lifting demands, there is a set of weights for you and you may choose to scale up or down in weight capacity as the need arises. You will find that the most popular is the 300 pound Olympic weight set, even though there are a few for which the standard weight is much less.